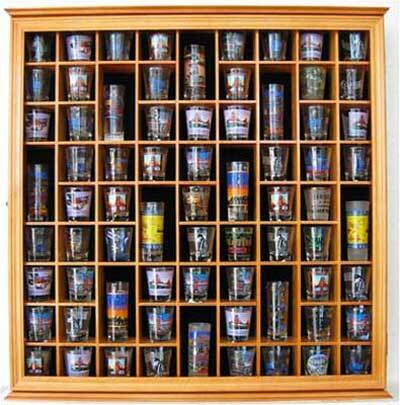 A great way to display your Shot Glass collections. Made from hand selected fine quality hardwood by our experienced craftsmen. Surface is sanded repeatedly to make it smooth and elegant. Black matted background to create a lovely display. Brass hinges and door latches. Wall brackets to hang (wall mounted). Anchors for extra weight support included. Glass door to protect from dust and damage.